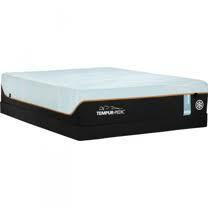 The Tempur-Pedic Luxe Breeze by Tempur-Pedic, is designed to help manage a cooler and deeper sleep all night long. Using memory foam technology combined with the ventilated TEMPUR-APR; this mattress can be up to 8 degrees cooler, resulting in a more refreshing sleep. This mattress is available in twin XL, queen and king sizes and comes with a 10 year full warranty.